Between Sirius/XM, ESPN, Twitter and my friends’ Facebook updates, I’ve been reminded that today marks the 10th anniversary of the Tuck Rule game. Earlier today I was just thinking how great it would be to have the complete NFL/NBA/NHL/MLB archives available to rewatch games on some sort of streaming service (stuck a pin in the topic for a post at a later time), and one of first games that came to mind that I’d watch to rewatch at least once a year was the Tuck Rule game even though I remember everything about watching the game and the game itself like it was yesterday. Mostly because I blame that game for crushing the Steelers 2002 Super Bowl run when they were expecting the Raiders the following week. 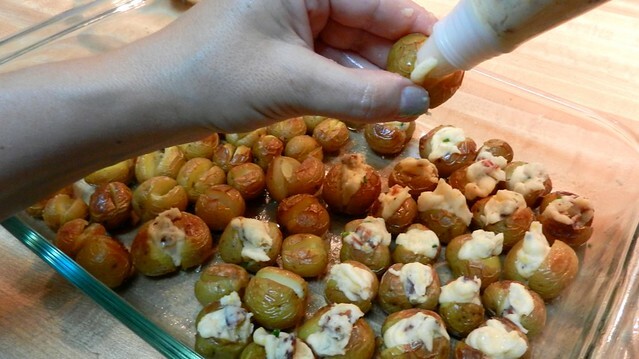 I was thinking about making my favorite Blue Cheese Baby Potatoes not that long ago, and thought to myself, “You know, I’d like mini baked potatoes instead. What a good idea, Sarah.” Jotted the idea down in my giant list of Football Foodie ideas in my Evernotes, but as a backup item. This happens all the time. I’ll have an idea, Google the idea, and somehow Rachael Ray will have already made it. Now, I don’t hate Rachael Ray like many people do. True, I don’t watch her show or read her books and I do think she should be dragged in front of the Hague for making the baby talk “sammy” part of the American lexicon, but in the larger scheme of things, I find her to be one the lesser evils of the current Food Network star universe. Even Anthony Bourdain has laid off picking on her these days. Anyway, back to Rachael Ray’s mini twice baked potatoes. When I looked at her recipe, the basic idea idea was the same but there was no way I’d make them the same way as she did. Red Bliss potatoes are too dry for baking twice, I prefer to use them when making a boiled potato. She uses butter in her twice baked minis, while over the years I’ve found that butter tends to make twice baked potatoes greasy. 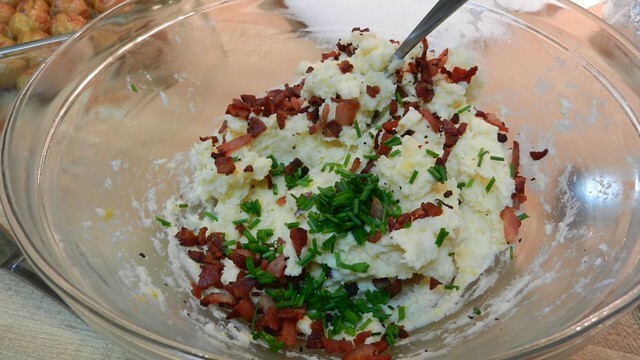 It also needed more bacon and sour cream. But the final straw in her recipe was baking the small spuds and then scooping them all out individually. What? Scoop out 24 individual potatoes? I’m on a schedule, woman! We did agree that extra sharp cheddar is the way to go as to make sure the cheese really stands out. 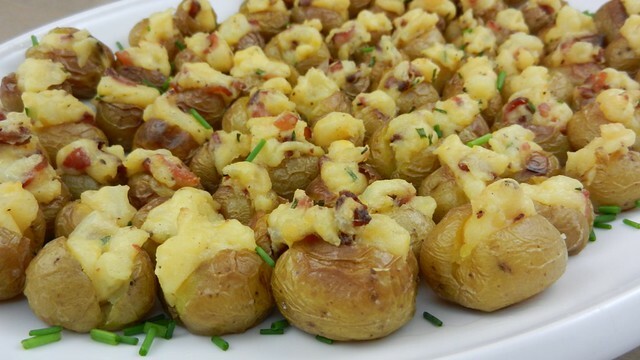 So consider our dueling recipes the Santonio Holmes of mini spuds; different for each team they play for. Actually, strike that analogy. Smoktonio was jerk on his way out of Pittsburgh and I’ve been thanking the Rooney’s lucky stars that they got rid of him when they did, especially in light of the past three — THREE — weeks of meltdown in New Jersey. If it wasn’t for the Giants, I’d say they’d have to declare the Meadowlands a Superfund site the fumes out of the Jets organization. Why are there three potatoes in the picture? Well, if I’m going to go ahead and heat up the oven for baked potatoes, I usually throw in one or two extra so I can reheat them and have them for lunch during the week. Saves time and energy. Stab the clean russet potatoes all over with a knife to release the steam while baking. 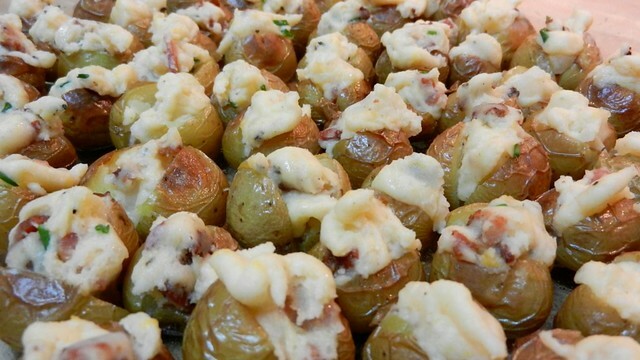 Rub each potato with olive oil and individual wrap the spuds in aluminum foil and throw in the oven. 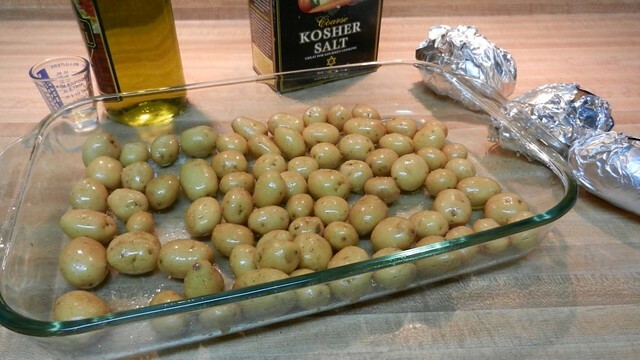 While the large russets are baking, put the baby potatoes in a medium roasting pan and toss with olive oil until lightly coated and about a teaspoon of kosher salt. After the russets have baked for about 30 minutes, put the baby potatoes in the oven along side their larger cousins. 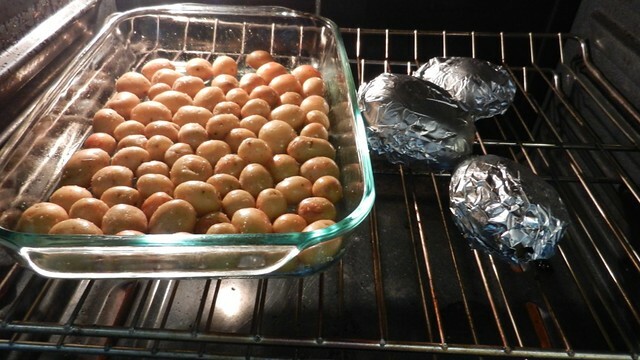 Bake for another 30 minutes, shaking the baby potatoes once or twice while roasting for even baking. With the potatoes in the oven, chop the bacon and cook over medium heat until crispy. Drain and set aside. When the potatoes are done remove from the oven and allow to sit aside for a couple of minutes to cool. Once the baby potatoes are cool enough to handle, slice each potato 3/4 of the way through and give a gentle squeeze to create a pocket for potato-on-potato stuffing and set aside. In a mixing bowl, take a baked russet potato or two (you’ll be able to judge on how much you need based on potato size), and scoop out the baked potato insides. Mix in the shredded cheddar, sour cream and about 1/2 teaspoon of salt and about a teaspoon of ground pepper combine until smooth. 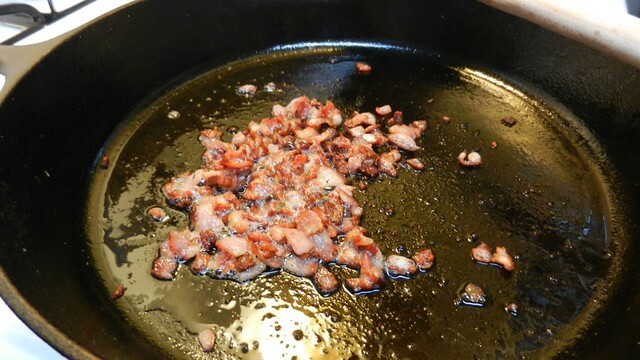 Fold in the bacon and the chives. 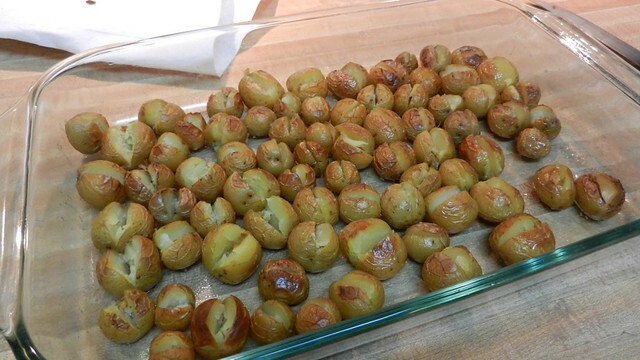 Once all the baby potatoes have been filled, sprinkle with a touch more salt and pepper and bake at 350º for about 20 more minutes or until the top of the potatoes are golden. Have some leftover potato stuffing? 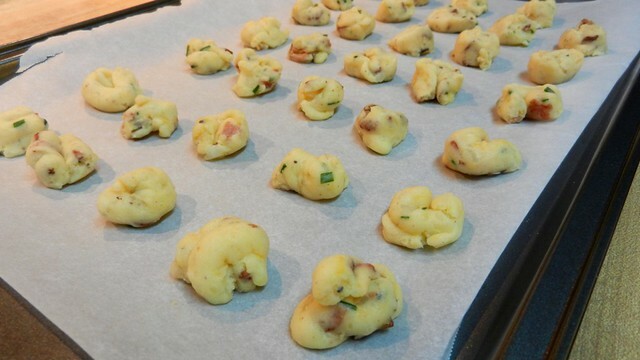 Pipe it onto a lined cooking sheet and bake for 15 minutes or until golden to create little potato puffs. If you’re planning a large spread for the game and need to save yourself some time, you can make the potatoes and stuff them the day before, refrigerate and then bake for a second time — adding about 10-15 minutes to the cooking time — when ready to serve. Bite sized twice baked potatoes are fun change from stuffed potato skins on game day. 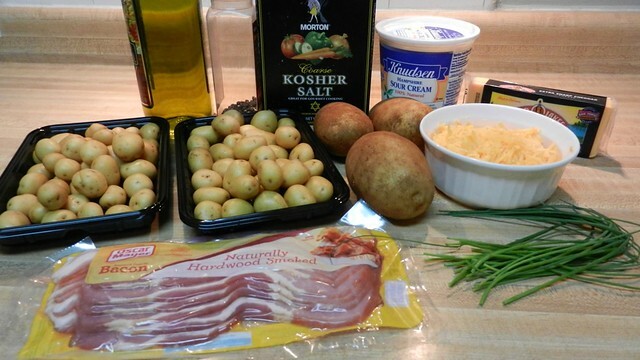 With the potatoes in the oven, chop the bacon and cook until crispy. Drain and set aside. When the potatoes are done remove from the oven and allow to sit aside for a couple of minutes to cool. Once the baby potatoes are cool enough to handle, slice each potato ¾ of the way through and give a gentle squeeze to create a pocket for potato-on-potato stuffing and set aside. In a mixing bowl, take a baked russet potato or two (you'll be able to judge on how much you need based on potato size), and scoop out the baked potato insides. Mix in the shredded cheddar, sour cream and about ½ teaspoon of salt and about a teaspoon of ground pepper combine until smooth. Fold in the bacon and the chives. If you're planning a large spread for the game and need to save yourself some time, you can make the potatoes and stuff them the day before, refrigerate and then bake for a second time -- adding about 10-15 minutes to the cooking time -- when ready to serve. Have some leftover potato stuffing? 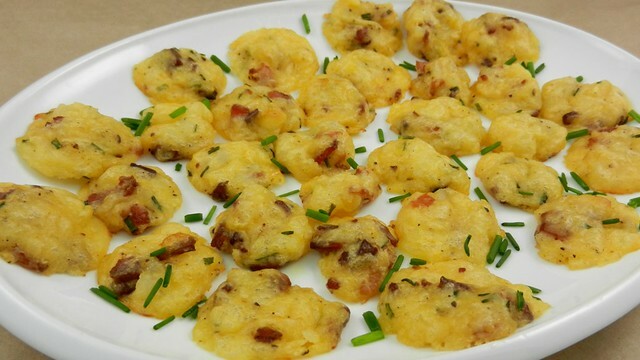 Pipe it onto a lined cooking sheet and bake for 15 minutes or until golden to create little potato puffs. “…and I do think she should be dragged in front of the Hague for making the baby talk “sammy” part of the American lexicon” Haha! Amen. And because I’m an equal-opportunity hater, Anthony Bourdain can kiss my fanny. What a hypocritical, pretentious, blowhard. Pardon me – bitchy rant over. Teeny tiny cocktail nibble potatoes like these always remind me of my parents’ friends Ronnie and Dave, who loved to host cocktail parties. One of my weirdest/most vivid memories of my childhood is of being like eight years old and holing up in the corner of their dining room, just inhaling tiny baked red potatoes topped with creme fraiche and caviar. These potatoes look good. Sorry I took this comment to a weird place. 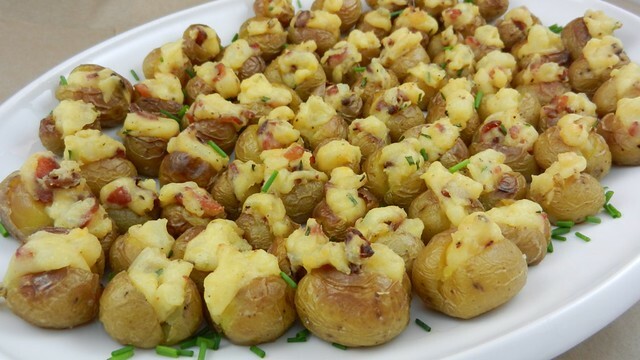 Rub each potato with olive oil and individual wrap the spuds in aluminum foil and throw in the oven. Did you do both with the larger potatoes? I usually do one or the other. Is there any particular reason why you both put oil and wrapped them in foil? Mostly because I like to eat the potato skins and like them to be extra soft. I’ve found that just wrapping them in foil doesn’t necessarily mean the potatoes won’t dry out.